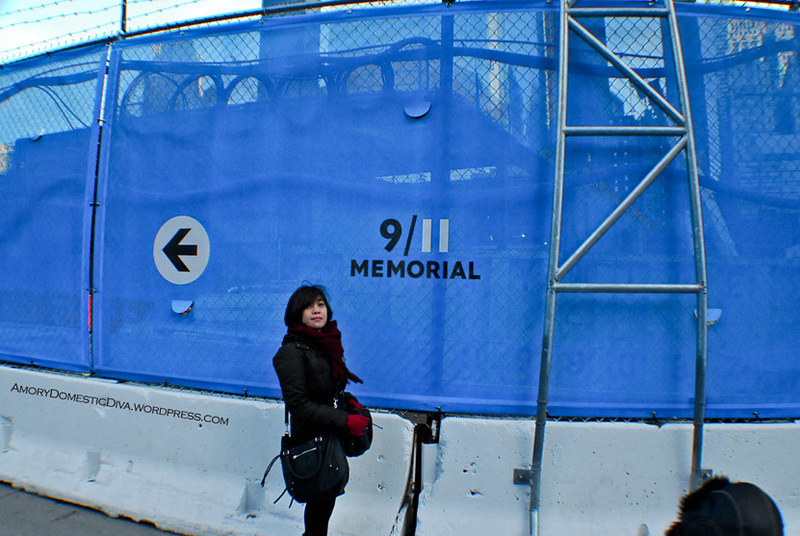 As a non-American visiting New York, I initially felt that seeing Ground Zero was just another tourist experience. However, after passing through the queues and security checkpoints I realized and understood the magnitude of the events that occurred in that particular place that day. 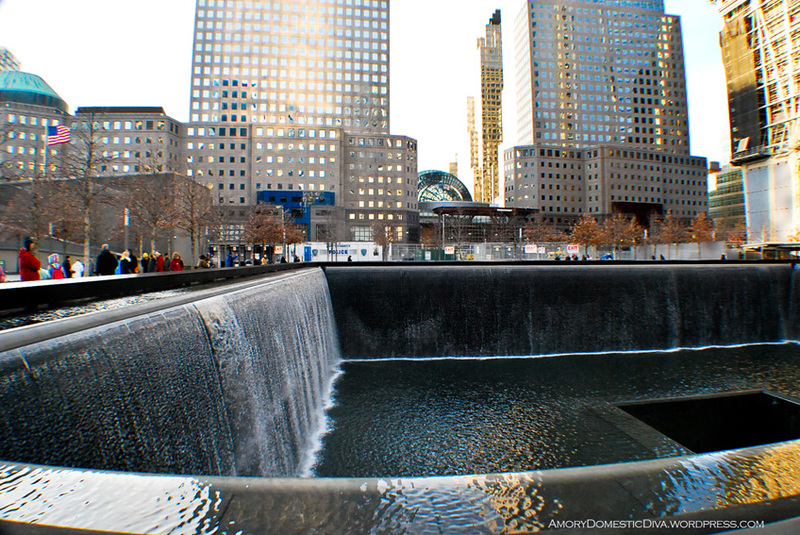 Twelve years ago, I was watching 9/11 unfold via news broadcasts while on a photo shoot in a studio. 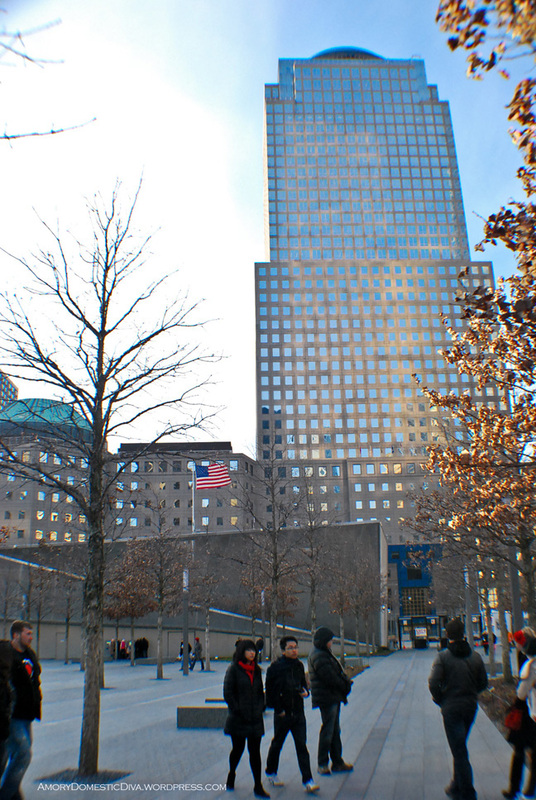 But it was difficult to really understand the scope of the destruction without seeing the giant space that the World Trade Center once occupied. 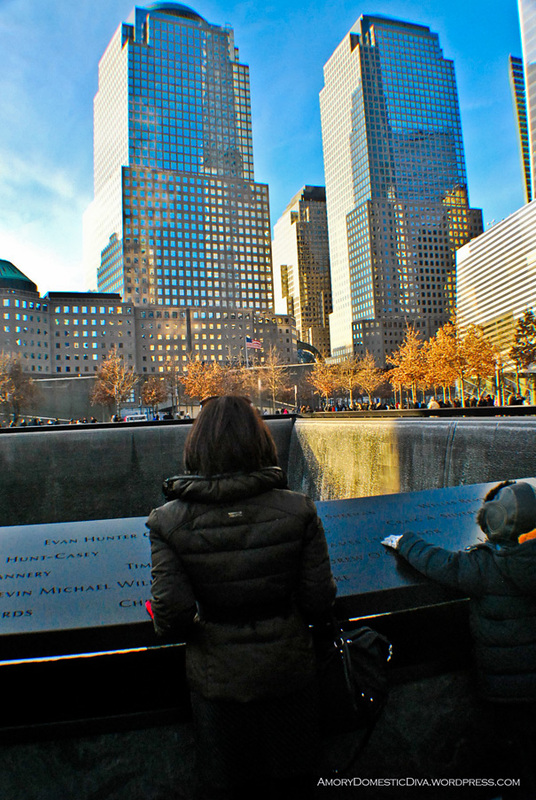 Not until you stand between the memorials and look up at the newly built One World Trade Center (or Freedom Tower) that you truly appreciate the scale of the tragedy. Just imagining not one but two massive buildings came crashing down and the horror of the lives lost was truly heartbreaking. 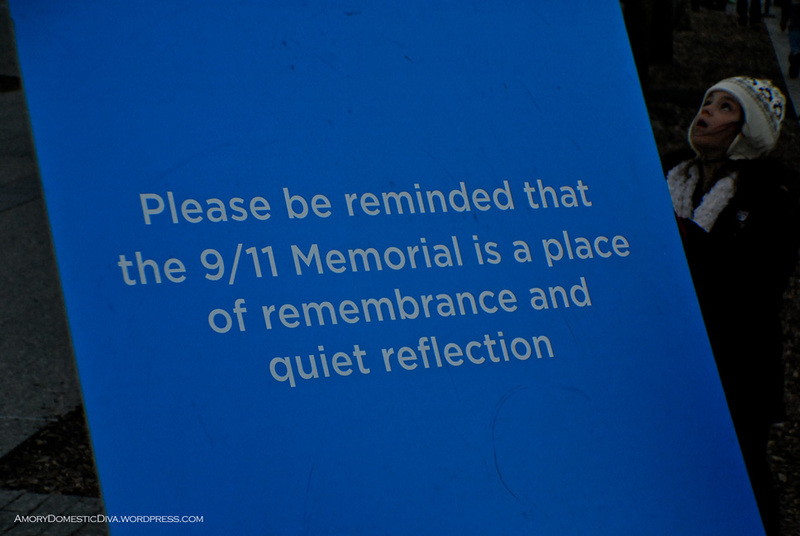 Allow me to share with you this experience that made me change my perception of 9/11 and of life in general. 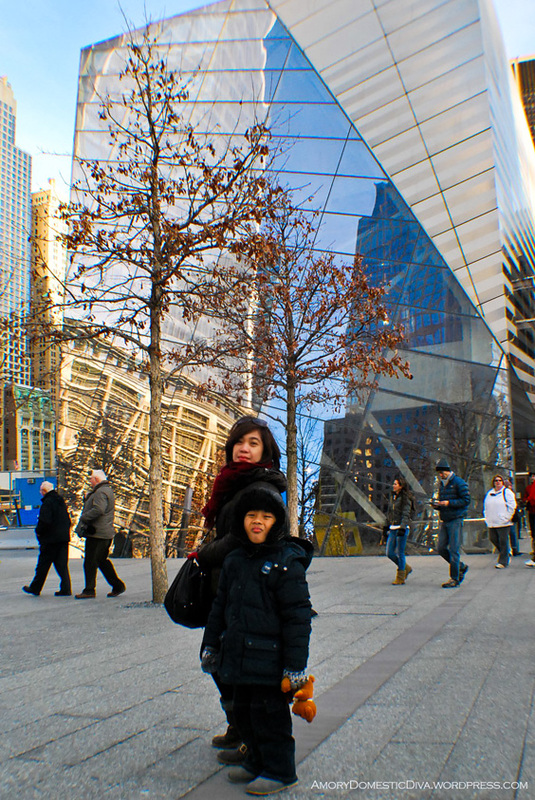 Our hotel was just literally a few steps away from Ground Zero so we just walked going there. 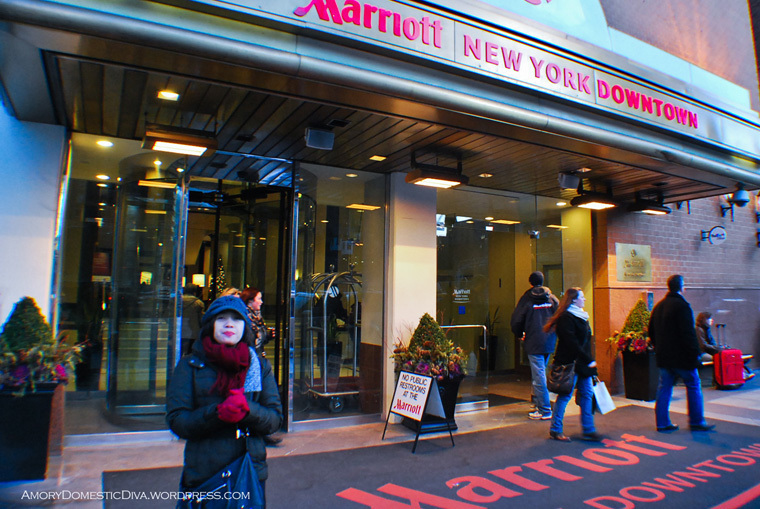 We couldn’t help but imagine what it would have been like if we were in the same hotel that very moment the attacks happened. We walked past the Fire Department of New York (FDNY) where they installed the Fire Dept. 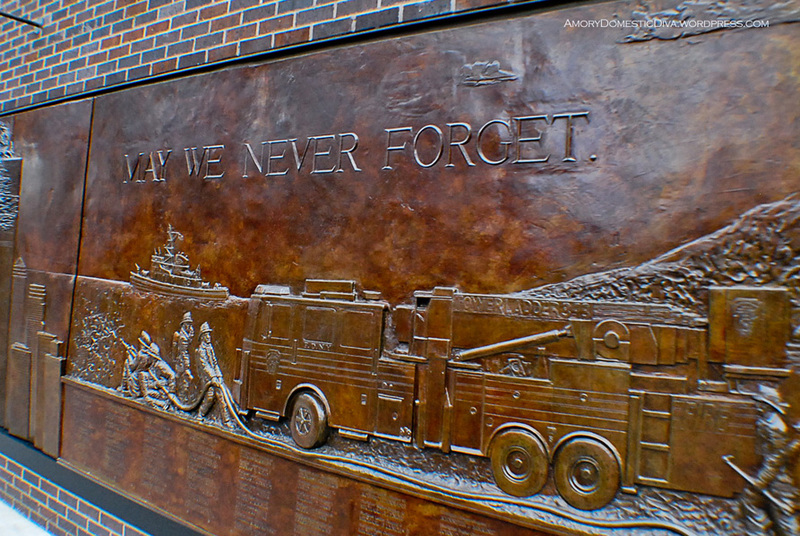 Memorial Wall honoring the firemen who died in service during 9/11. The line was long but moving quite fast so waiting time was bearable. Here are some images while on queue. The “blue guards” and these signs were everywhere. 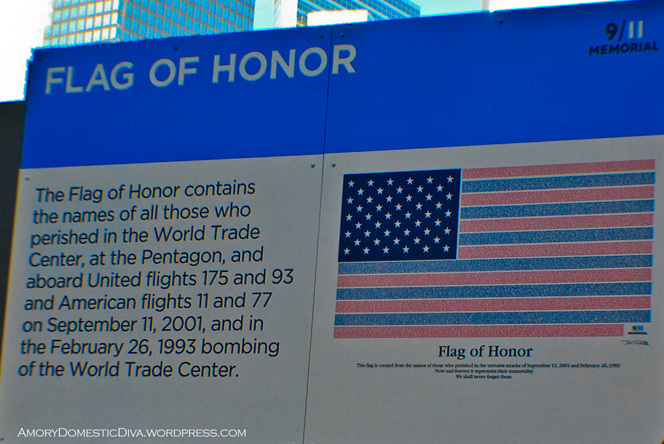 If you look closely at this flag of honor, this is made up of names of all those who perished during that time. 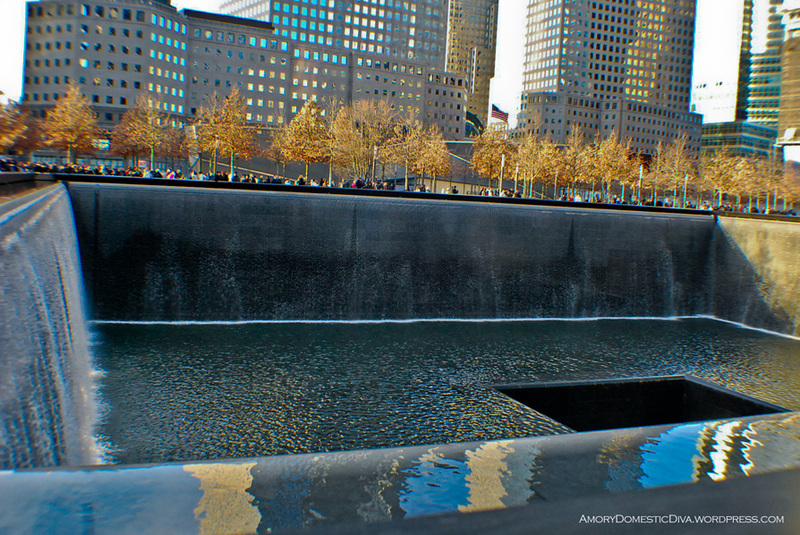 There were two square pools where the towers used to stand (North and South Towers). The pools were breathtaking! The perimeter of each pool had fountains that dropped water to the bottom of the pools. 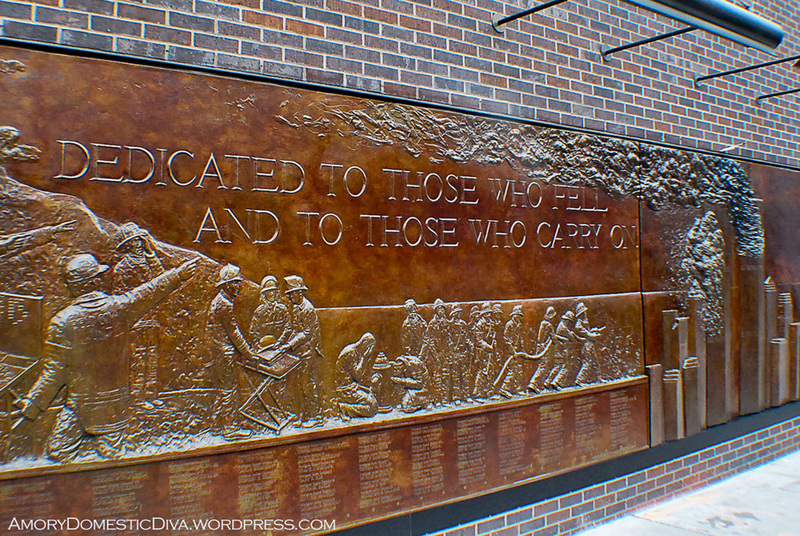 The names of all those who died on the site (WTC employees, firemen, first responders, ordinary New Yorkers, etc.) 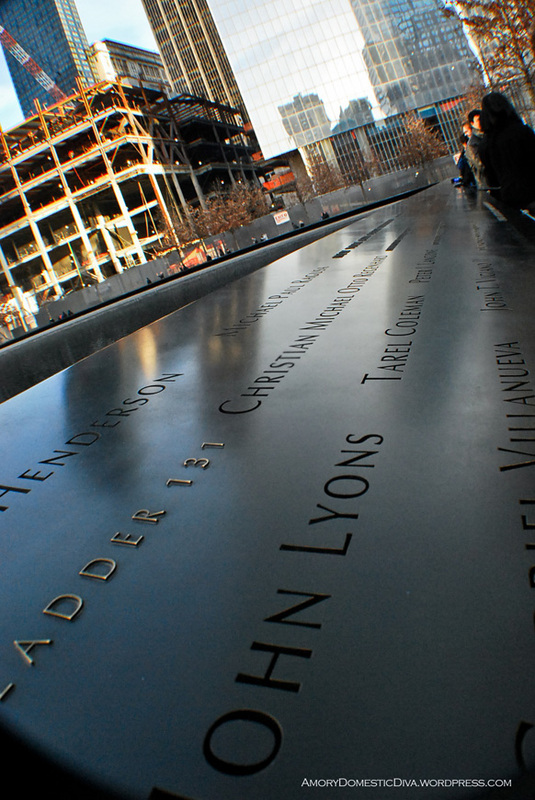 were inscribed at the edge of each pool. 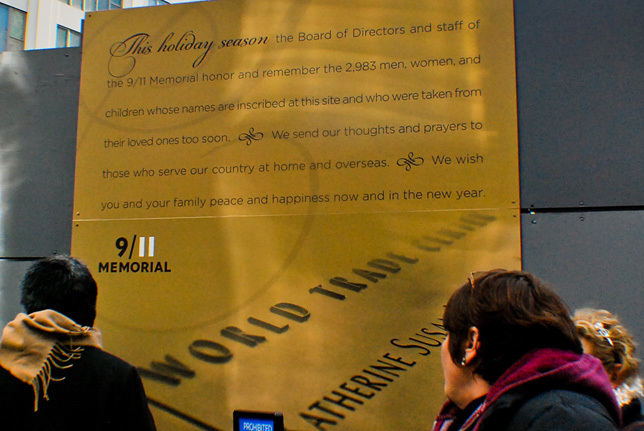 Everybody was encouraged to touch the inscribed names and offer prayers. 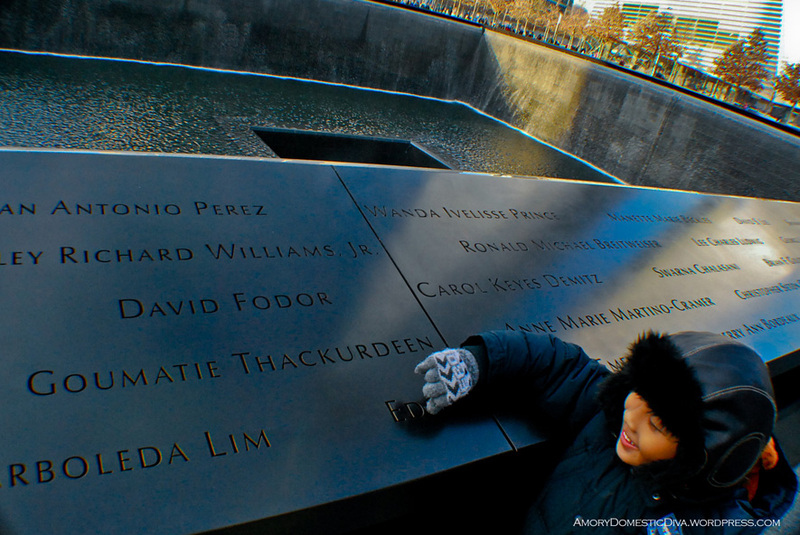 Little Boy was greatly affected by the 9/11 story that until this day, he includes everybody in this tragedy in his night prayers. 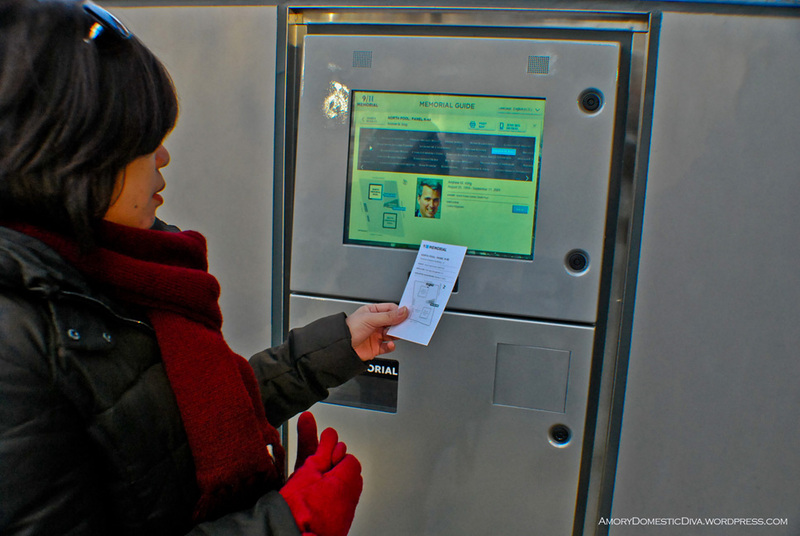 There’s an electronic information guide/directory inside the memorial that gives information on where to find the name of a loved one. It wasn’t overly crowded considering it was the holidays. 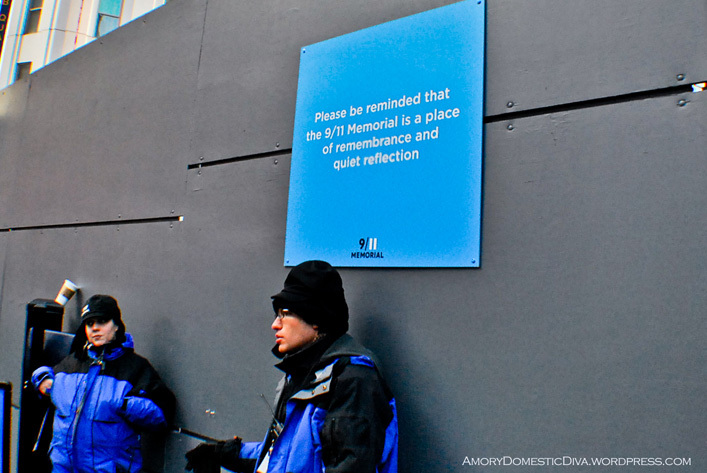 There were plenty of room to move around the memorial. The security was always on alert mode. 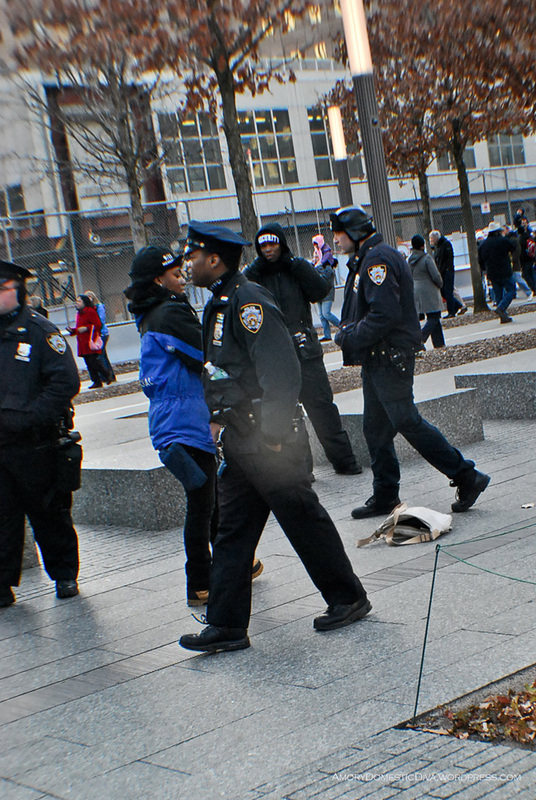 We saw them in action when an abandoned bag was found on the ground. 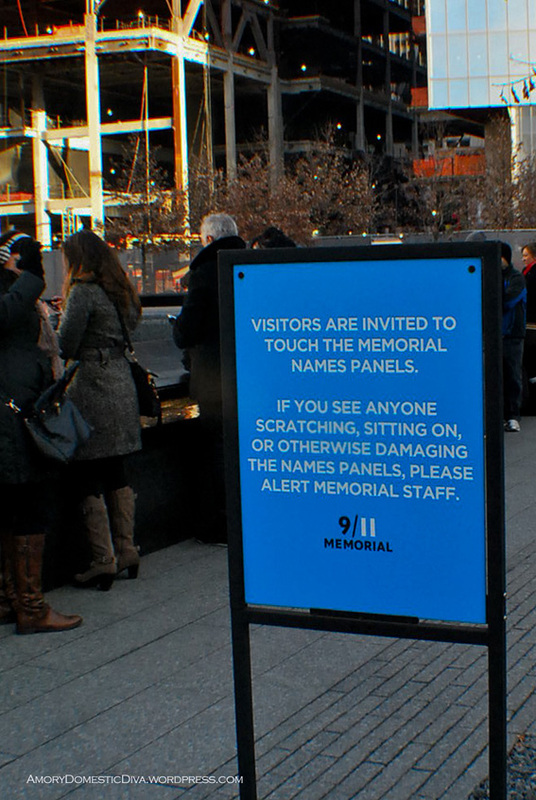 The memorial guards were very strict… but friendly too. 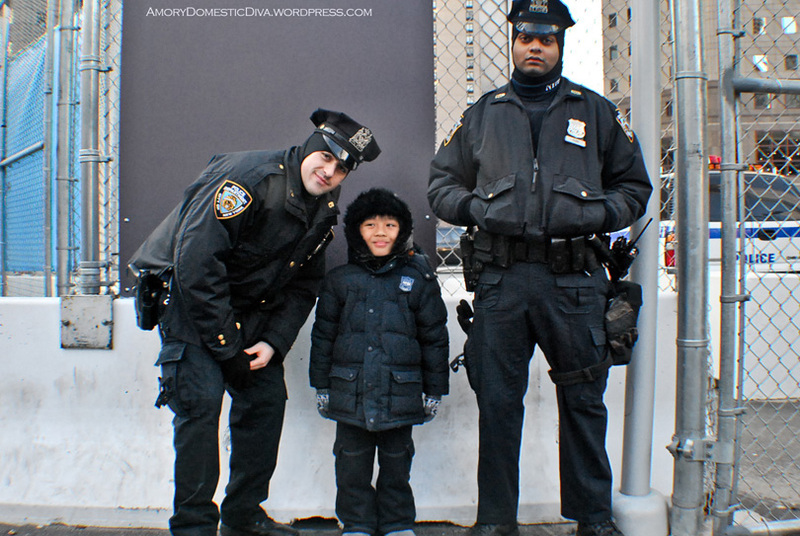 Little Boy, who was into anything military, asked if he can have a photo with them and they obliged. Behind us was a structure inside the memorial ground that was said to become a museum which they say will open in 2014. 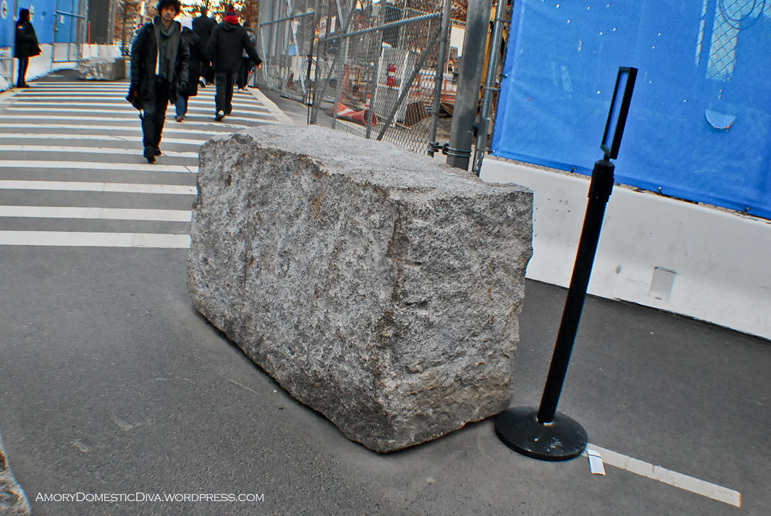 An actual debris that was part of the original WTC structure. Seeing the whole area being a flurry of construction is bittersweet for me. 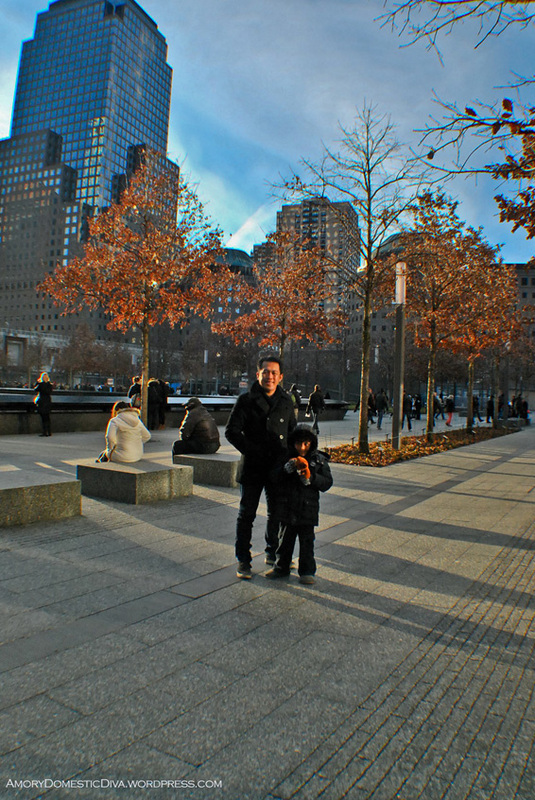 WTC will never be the same again but I have to give it to the New Yorkers for their fortitude in developing the site again. 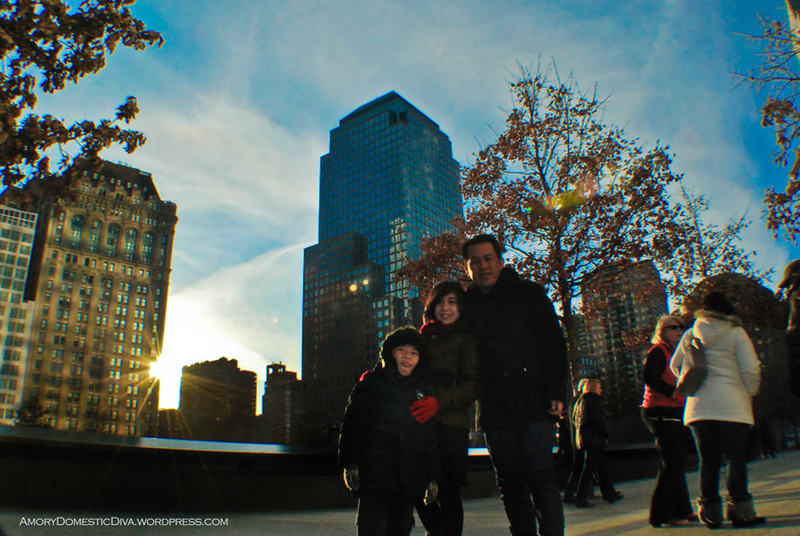 The One World Trade Center or 1 WTC a.k.a. 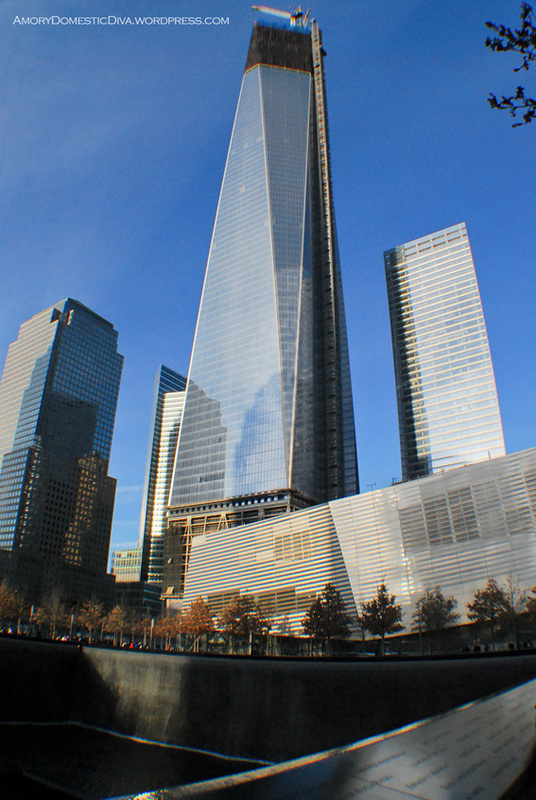 Freedom Tower is the primary building in the New World Trade Center complex. 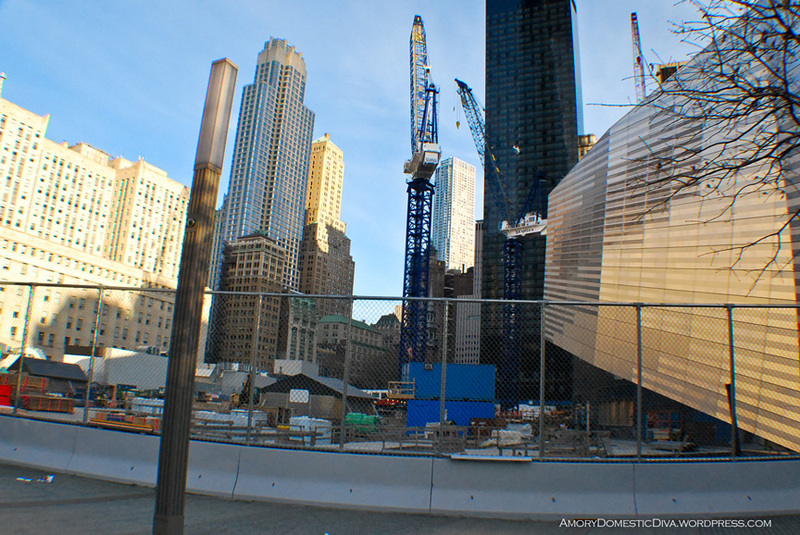 Its construction began in 2006 and was almost finished when we visited in December 2012. It was a surreal experience. 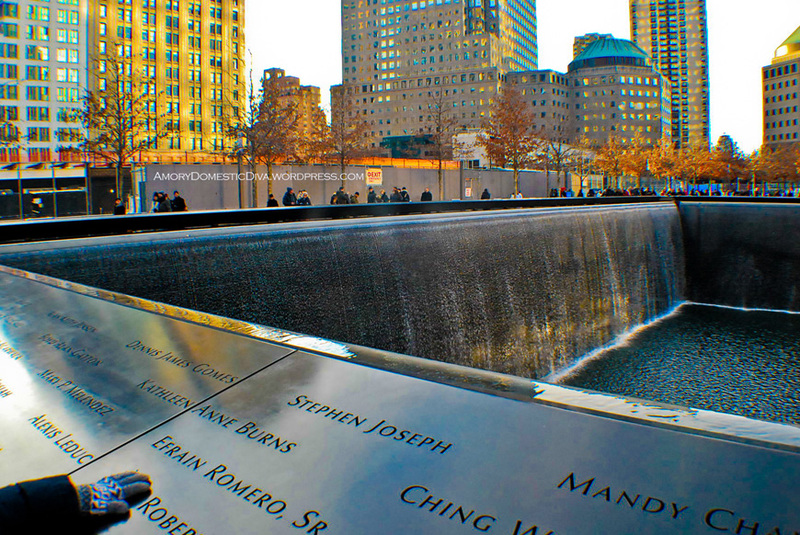 There was a point when we were just standing still, staring at the water, touching the etched names, not talking for a few minutes offering a silent prayer. I have no connection to the site nor did I personally know anyone who was affected but the way I see it, 9/11 wasn’t just a New York thing. It touched the entire world.